This month's book review round-up was brought to you by a new e-reader. Hubs bought me a Kobo Clara HD as a gift after many months of me hesitating over buying it for myself and it's perfect. You ever have a situation where you didn't know how bad it was until things became good? Well, I'd been reading ebooks on my iPad and I didn't realize how disruptive and harsh the blue light was (even in night mode), or how heavy the iPad felt when I held it for long periods of time (hello, wrist strain). The Kobo Clara HD is much easier on the eyes when I'm reading in the dark and less disruptive to my and Hubs's sleep, and it's so small and lightweight. Giddy with joy, I went on an ebook shopping spree which included the four books featured here. 1. I Owe You One by Sophie Kinsella. I Owe You One starts with a premise worthy of any peak '90s rom-com: A handsome man and a quirky lovable woman, both strangers, are in a coffee shop; the man asks the woman to watch his laptop while he steps outside to make a call; in the few minutes this takes, the entire coffee shop ceiling caves in right over where they were sitting. Luckily the woman, Fixie Farr, possesses quick reflexes and an insatiable desire to fix anything broken or amiss around her, whether it's straightening a crooked shelf or smoothing out family drama amongst her relatives as they figure out how to run her late father's housewares shop together. Fixie saves his laptop from disaster, a favour that the grateful man, Sebastian, returns by writing an IOU on a coffee cup sleeve. Fixie would never dream of redeeming the IOU for herself, but maybe to help her childhood crush Ryan get a job when he moves from LA back to England...? What started as a chance encounter becomes an escalating game of favours returned, and the beginning of something more between Fixie and Sebastian. I'm a longtime fan of Kinsella's and the scenes between Fixie and Sebastian positively sparkle. That being said, I Owe You One didn't quite achieve liftoff because of how odious Fixie's family members are. I was cringing so hard at how cruel and awful they were to her that the comedic moments fell flat. By the time Kinsella started her redemption arcs for each family member I'd sort of mentally written off each character. If you're looking for a light and breezy read this book checks both boxes, but I don't like it as much as Kinsella's other recent works like My (Not So) Perfect Life, which I reviewed here. 2. A Simple Favor by Darcey Bell. I'm sure by now you've seen the thriller starring Blake Lively and Anna Kendrick or at least read the online spoilers, but if not here's a quick primer on what this book is about. Stephanie is a single stay-at-home mommy blogger who befriends another mother, glamorous and beautiful Emily, at her friend's school. One day Emily asks Stephanie for "a simple favour"—pick her son up at school while she's at work in the city, and watch him until she returns later that evening. But Emily doesn't return and the situation escalates into a missing persons case and possibly murder. This is a fun thriller with plenty of twists and turns that will keep you engaged until the very end. As unbelievable as some of the plot points are though, the tiny detail that really challenged my verisimilitude was the name of Emily's employer. Emily works in fashion PR for a designer named Dennis Nylon, who is supposedly on par with Dior or Chanel, whose company is Dennis Nylon Inc. Is it just me, or does "Dennis Nylon Inc." sound more like a textiles factory in China than a high-end fashion designer? 3. Field Notes On Love by Jennifer E. Smith. 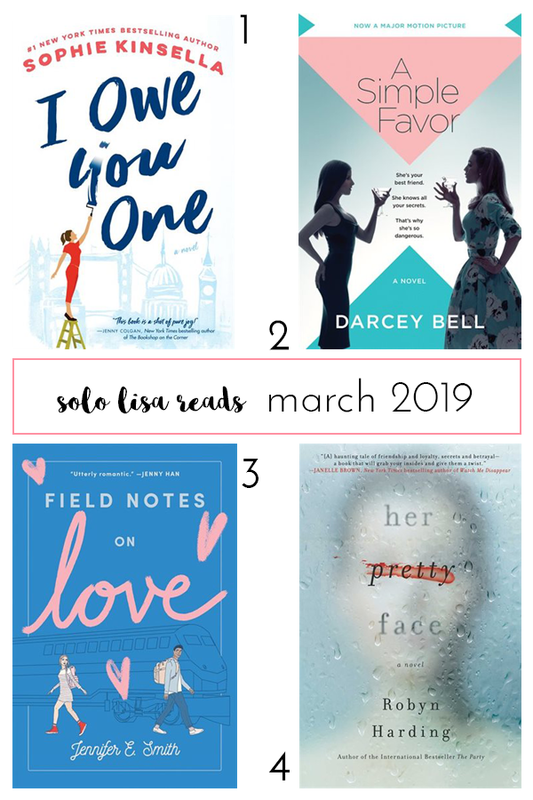 Okay, I was pretty tough on the first two books in this month's review round-up, but I harbour pure admiration for Field Notes On Love, a YA romance that hits the same tender notes as To All The Boys I've Loved Before. (In fact, Jenny Han herself declared this book "utterly romantic.") British boy Hugo is all set to go on a week-long cross-country train trip with his longtime girlfriend Margaret in America after they graduate from high school. But on the eve of their trip, Margaret breaks up with Hugo and leaves him in the lurch. All the non-refundable, non-transferable tickets and reservations were made under Margaret's name and Hugo still really wants to go. So what does he do in this modern day and age? He posts an online ad looking for a Margaret Campbell who's willing to travel with a complete stranger in exchange for a free trip. The Margaret Campbell who answers is a young woman from New York, an aspiring filmmaker struggling to be authentic and vulnerable in her work. Do they fall in love? Yes. Is their week together life-changing? Of course. But in Smith's capable hands, the story feels fresh and sweet instead of trite and may even leave you a little misty-eyed. Hugo and Margaret also get a big boost from a charming, diverse and well-drawn cast of supporting characters, which include Hugo's sextuplet siblings, Margaret's gay fathers and a feisty grandmother. 4. Her Pretty Face by Robyn Harding. Frances feels as though she and her family are all wrong for her son's fancy new private school in a tony Seattle suburb: her husband doesn't make as much money as the tech millionaires they live among; her son has special needs and is bullied at school; and Frances sees herself as overweight and frumpy compared to the other school moms. Things change when Frances befriends the mom of her son's sole friend at school, Kate. Kate is everything Frances is not—beautiful, wealthy, popular amongst the other parents. The friendship opens new doors for Frances and for the first time she feels like she belongs. Now here's the kicker: One of these women is not who she says she is, but a convicted murderer whose real name is Amber Kunik. Can you guess which one? Robyn Harding's second novel is stylish and self-assured, raising questions about guilt, responsibility and the monsters within us. The way the story moves across timelines and characters is reminiscent of her debut novel The Party (which I reviewed here), but the narrative sleight-of-hand employed here is much more complex.